Our alarm was set for 5 am but Laurie maintains she didn’t hear it. 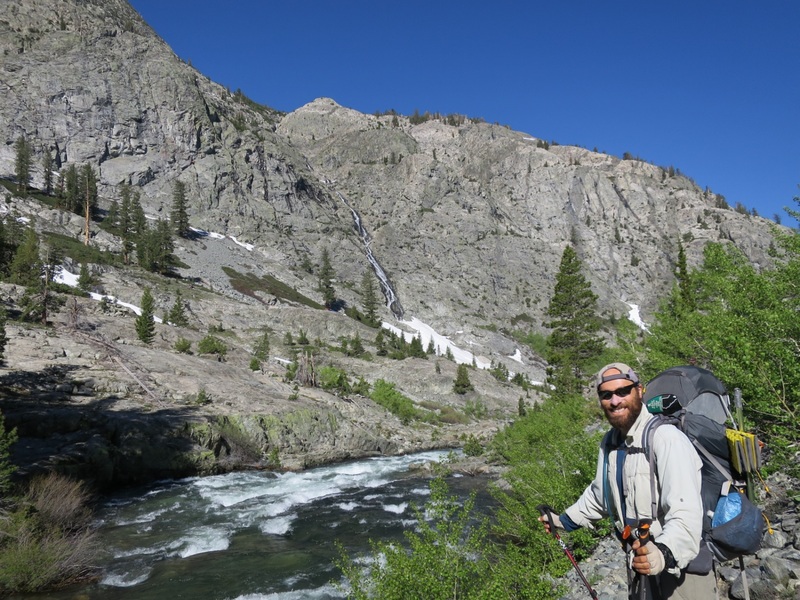 Andy was wearing ear plugs so he doesn’t hear anything – not even the rushing river 100 feet from the tent. We had wanted to get up early to catch up with Dirk and Sabine to give them our extra food. 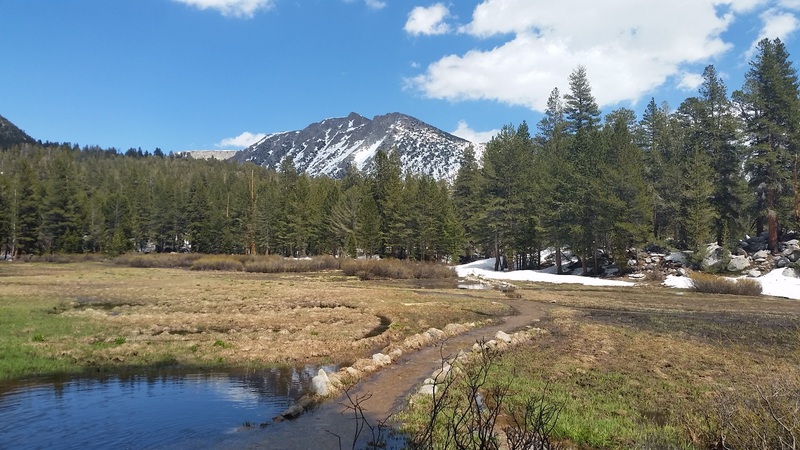 They have a box waiting in Tuolomne Meadows but, like most people, they are going slower than planned because of the snow. We also wanted to thank them for their kindness and on the PCT food is the most valuable currency. They get up early and had talked about wanting to do 20 miles…we hoped they would change their mind because we enjoy hiking with them. We were walking just shortly after the sun kissed our tent. The mosquitoes weren’t out yet and for that we were grateful. We walked about 10 minutes before reaching where the trail normally crosses Evolution Creek. The water moves faster here and although lower in the morning, we were very happy with our decision to cross at the alternate. 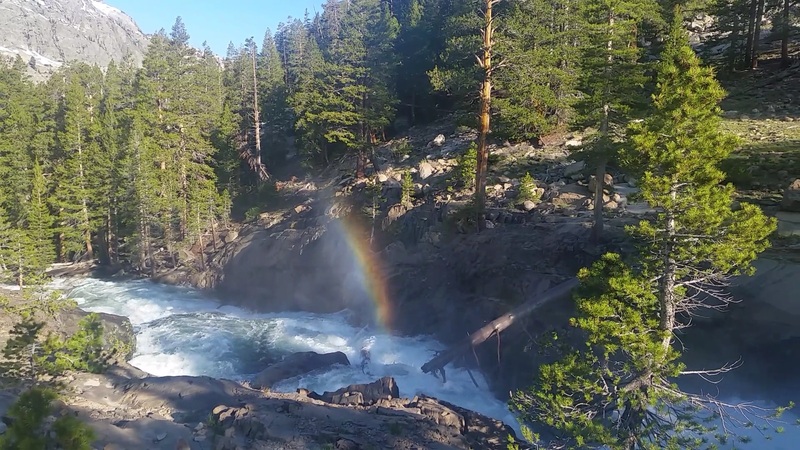 Shortly after starting down the switchbacks we saw a rainbow emerging from the forceful Evolution Creek waterfall. It was beautiful and a great way to start the morning. 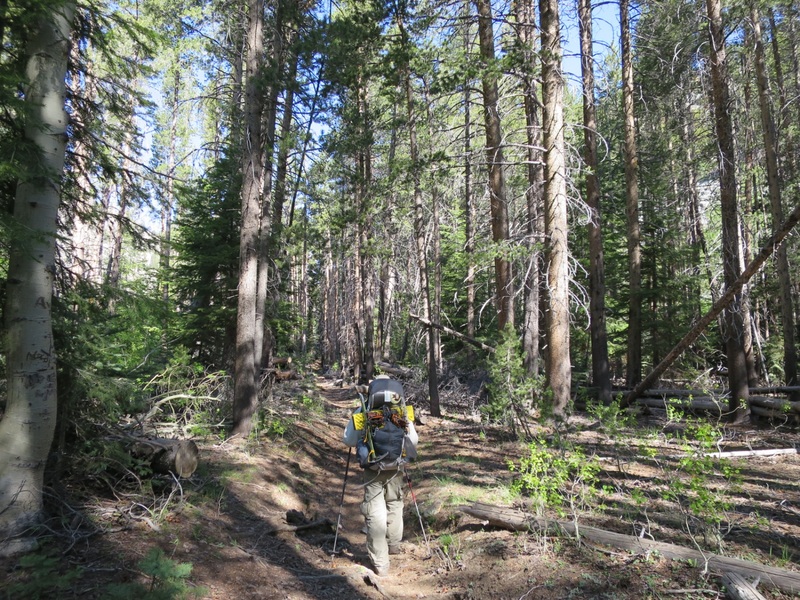 The trail switchbacked down to the South Fork of the San Joaquin River. At the bottom Lefty, Stoic, So Hard and Pounder caught up with us. They crossed Evolution Creek this morning through the meadow as well and the water was about 2 inches lower than yesterday afternoon. We were happy with our decision. Starting the day with wet feet isn’t fun. 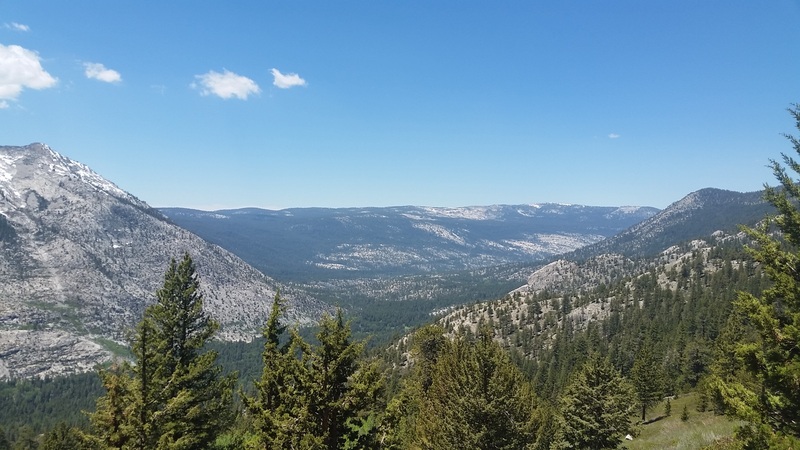 We hiked through the woods, paralleling the South Fork of the San Joaquin River. The walking was easy but our feet were tired and the bugs were feasting on us. We have been hiking for 12 days straight. Some days are longer than others. We have both found that trail runners are more comfortable than our boots. We look forward to switching out our shoes in Mammoth at the end of the week. The next few miles were mellow. We were in and out of the forest, walking on soft pine needles, soft dirt and rocks. 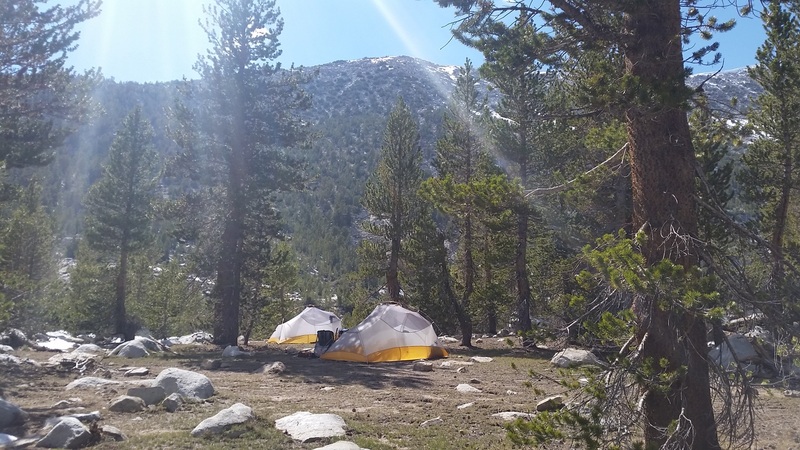 We found Dirk and Sabine sitting under a tree near a bridge crossing at the Piute Pass junction. We were happy to learn that they planned to camp with us tonight. We hiked on. This part of the trail was familiar to both of us. There was no snow to obstruct our memories. 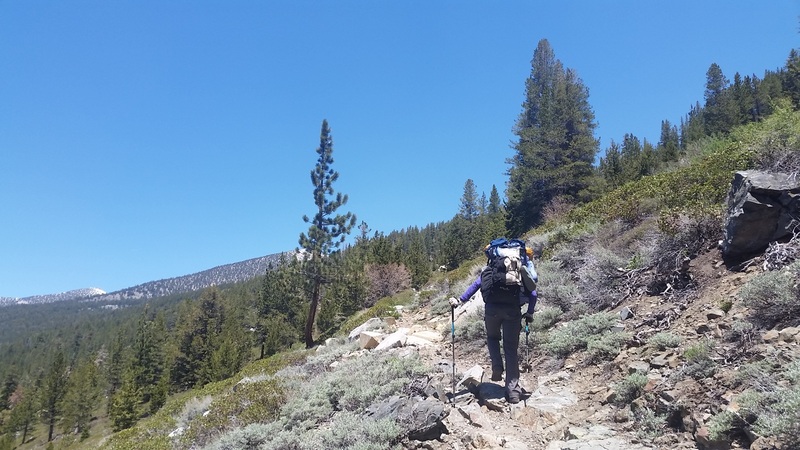 We both remembered the descent from Sallie Keys Lakes to Muir Trail Ranch to be tedious and steep. Andy remembers thinking to himself that he wouldn’t want to go up those switchbacks, but that’s exactly what we had to do. The trail started climbing gently at first. We walked through soggy meadows and forests with lots of mosquitos. Laurie started walking faster, swinging her arms and swearing at the mosquitos. Andy put on his bug shirt and patiently walked behind her. Normally he is the one with sweeter blood but today Laurie was the winner. As we walked up we left the water puddles and damp ground. The misquitoes became less abundant and the switchbacks took over. We zig zagged our way up the mountain. It was just past noon and it was hot. Exposed and HOT! We climbed on, not wanting to stop in fear of being bitten. Around 1:30pm we crossed Senger Creek and had lunch on a rock. From here it was only 2.5 miles to camp. Laurie dragged. She had used all of her steam fighting misquitoes while climbing and was tired. With very little miles left for the day we took an hour long lunch. Dirk and Sabine caught up with us and stayed to chat. They had questions about how best to ship their bear can up the trail since they want to keep it as a souvenir of their PCT hike. 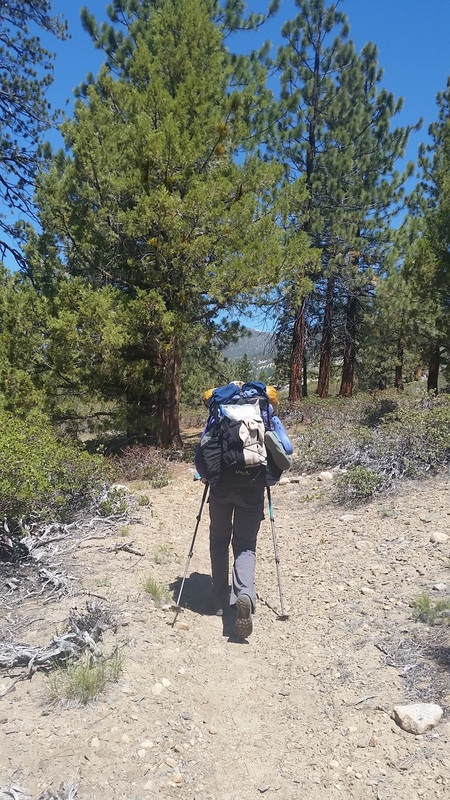 We splashed cold water on our faces from Senger Creek, shouldered our packs and slowly made our way past patches of snow and through waterlogged meadows up towards Sallie Keys lakes. In many places the trail was a river. We walked on rocks and grassy patches trying to keep our feet dry. Around 3:30 we turned the corner and saw tents. We had planned to camp with the crew we’ve been leapfrogging with the last few days. They were set up when we arrived so we went in search of a flat spot. It just so happened we found a spot next to Dirk and Sabine. We got settled, put up the tent and went back to the lake. Andy got water and Laurie took a bird bath. Brrrr. We returned to our tent and napped for about a half hour until Laurie overheated. There were grey clouds overhead but it was still warm under the sun. 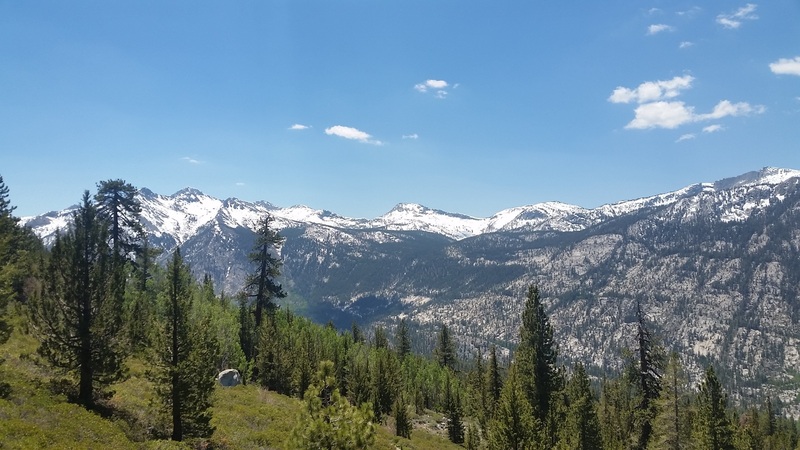 We went over to Dirk and Sabine and reassured them we would call Tuolumne Meadows tomorrow if we had service on Laurie’s phone at Bear Ridge. They are such great people. Very sweet and genuine. We want to do all we can to help them. We left them with our guidebook pages, gathered our food and went to have dinner with Stoic, So Hard, Lefty and Pounder. We haven’t had dinner with a group of hikers all trail. They are good people and we had fun getting to know more about them. Around 7pm we returned to our tents to clean up and go to bed. Tomorrow promises to be another challenging day with a pass early in the morning and then crossing Bear Creek a few miles later. All that is for tomorrow. We are tired and need sleep. Today was supposed to be easy – no passes or river crossings – but it was hard. I think we need a zero soon. 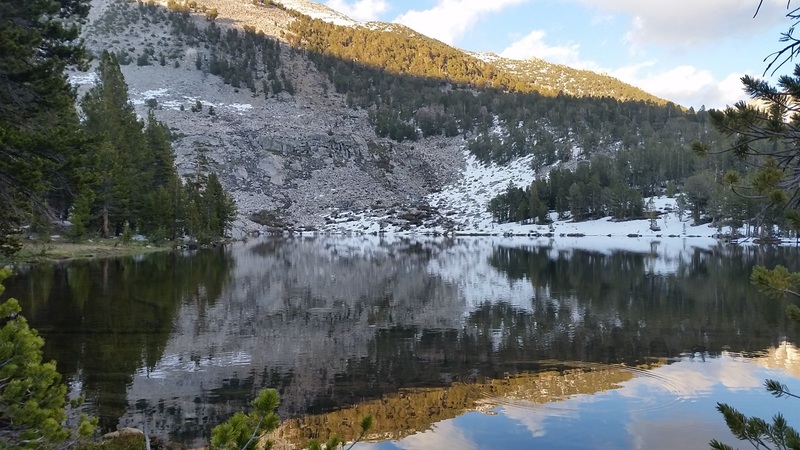 Tonight we are grateful for being able to help fellow hikers and clear, cold water.